Earl Fitzwilliam, Wentworth Woodhouse, sold Christie's London (Spencer House), 15 July 1948, lot 111. Joe and Madeleine Bain (+), sold Christie's New York, 14 October 1994, lot 418. The Connoisseur Year Book & Diary, 1949, p. 49. The attribution of this commode to Wright and Elwick is based on the same principal evidence as all the furniture from Wentworth Woodhouse that was sold in these Rooms in July 1998. This is primarily the close connection to a pattern in Thomas Chippendale's Director, (specifically 3rd. ed., 1762, pl. LXIX), exotic timber (fustic), unusual carcase construction, and extensive payments in the Wentworth accounts. 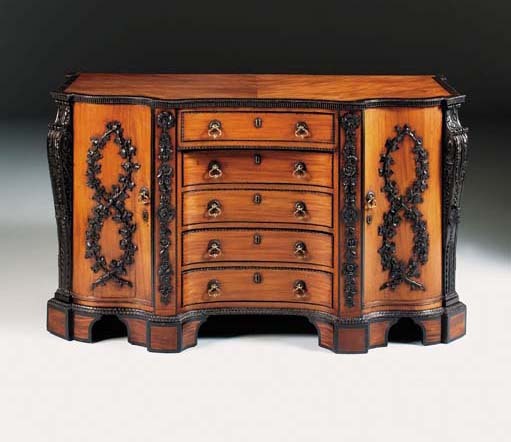 The choice of an exotic timber was paralled by the fustic and floral marquetry commode, also from Wentworth Woodhouse, that was sold in these Rooms, 8 July 1998, lot 65. Several references note the difficulty with which Elwick obtained exotic woods.The choice of an exotic timber is characteristic of Wright and Elwick and of Wentworth Woodhouse. Several archive references note the difficulty of obtaining exotic woods. In 1773 he requested permission to send William Constable at Burton Constable on approval: 'a very Curious Ladys Toylet of mix'd Woods, viz Violet, Citron & Sypress, & itis Extra Workmanship...I shall not have it in my power to make such an other, as I could not procure such a fine assortment of woods in the Kingdom' and in 1779 he complained that 'the foreign woods I should have Rec'd from Amersterdam (sic.) Cannot be got over here on any pretence' (C. Gilbert, 'Wright and Elwick of Wakefield, 1748-1824: A Study of Provincial Patronage', Furniture History, 1976, p. 40). This golden commode of veneer is conceived as an altar to Venus, and designed with a triumphal-arch façade of Cupid-bow form, and with its recessed drawers flanked by commode compartments with paired pilasters. All these elements feature in elegant patterns for Commode Dressing Tables issued in Mayhew and Ince's Universal System of Household Furniture, l762. While John Mayhew's patterns also featured truss pilasters in the antique or Roman fashion as introduced by Inigo Jones (d.l652), these were serpentined and varied in the George II picturesque manner. However on this commode, the straight back pilasters are antique-fluted like mouldings of its (sun)rayed and palm-wrapped top, while its architecture and black enrichments, reflect the George III antique or Etruscan fashion popularised by the court architect Robert 'Bob the Roman' Adam (d. l792) in his Works in Architecture, l773. Fashionable bedroom apartments of the l770s were richly furnished with Etruscan or Grecian vases in allusion to marriage as a 'Sacrifice at Love's Altar'. Here the palm-wrapped trusses are flowered with Apollo sunflowers and celebrate lyric poetry and love's triumph. Grand dressing-rooms served as rooms-of-reception, like drawing-rooms, so this commode's festive ornament also serves to recall the Roman adage concerning Love - 'Sine Cerere et Baccho friget Venus'. Thus sunflowered libation paterae, recalling the harvest deity Ceres, are tied by floral festoons to the pilasters, and trophies of bacchic vines are tied to the doors. The ornament for both the sunflowered medallions and the vines derives from Apollo's temple at Palmyra as illustrated in Robert Wood's Ruins of Palmyra, l757. In addition the commodes sides display targets for Cupid's arrows that are held by clasps of Roman foliage in Venus-shell form.